March 26, 2013 in U.S.A.R. On a bright, sunny Saturday afternoon in winter, Malta’s countryside quickly attracts people from all walks of life, all of whom are eager to relax, unwind and have fun. To mention one example, Wied Babu, in the limits of Żurrieq, is very popular with families who go for walks in the valley, as well as climbers seeking to practice their sport. 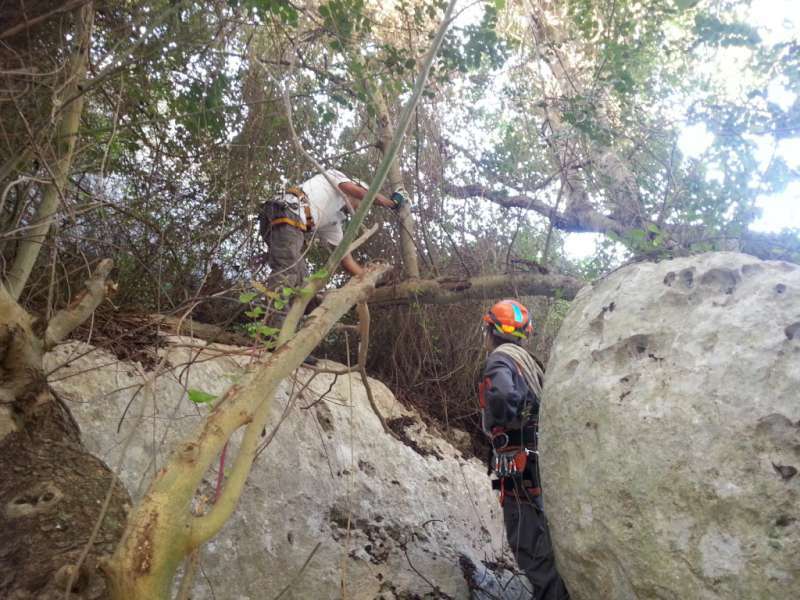 The area, however, does require that adequate precautions are taken as the rock face is steep in places and may be quite slippery. Grass near the edges adds to the danger, while trees and shrubs are likely to hide away from view anyone who may slip over the edge. If the worst were to happen, help would need to be requested as quickly as possible – not only because the injuries require rapid treatment, but also because darkness will make the rescue efforts more difficult. In the evening, the temperature drops quickly, thus increasing the danger by possibly leading to hypothermia for the injured person. This is one of the scenarios that are periodically practiced by the Emergency Fire and Rescue Unit (E.F.R.U.) 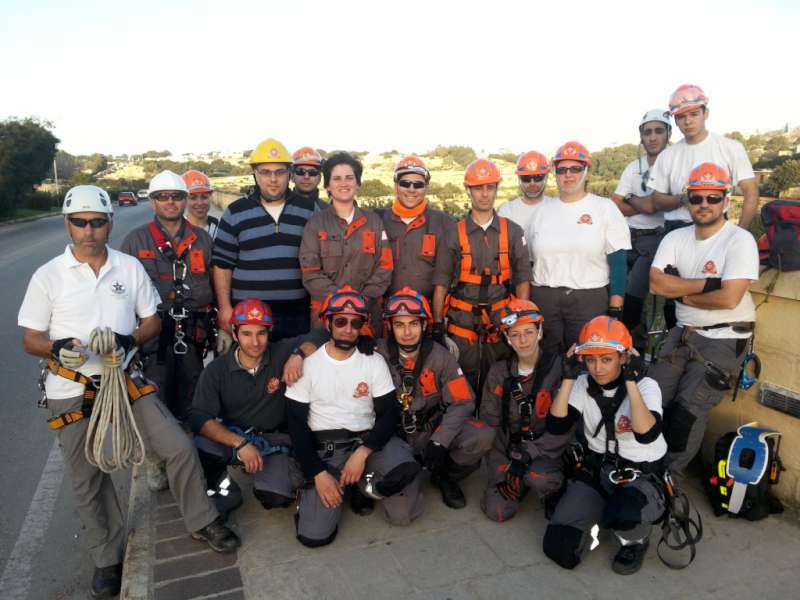 volunteers during their regular training. 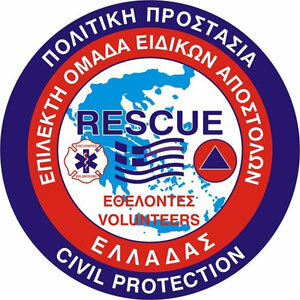 Apart from the regular volunteers, the auxiliary unit of the E.F.R.U. 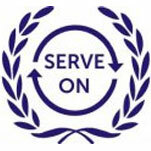 also participates, to keep current with the rescue techniques used. 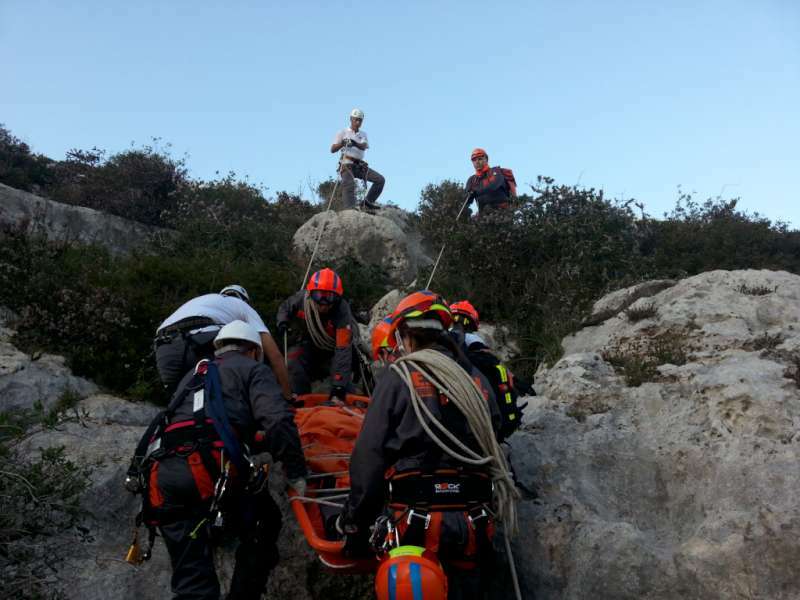 The training scenario gave indications that two persons had gone missing in the valley, possibly injured after a fall while practicing climbing. They were alone, so no one was able to point their exact location. 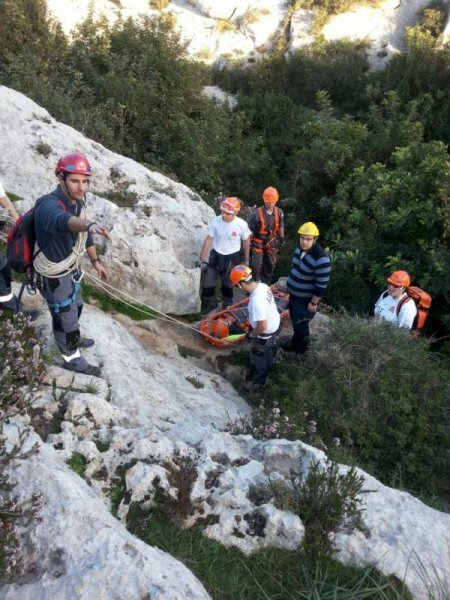 The group of volunteers was divided into two teams and each team’s leader sent four persons to search half of the valley – two at the bottom and another two looking from higher ground. Meanwhile, the rest of the team prepared the equipment needed. Such a search needs to be done carefully and thoroughly, as the casualty may be unconscious or unable to call for help or reply to the rescuers’ calls. Rescue dogs may be used to help during the search (see Nosey Heroes ), however there may be situations where it is not practical to use dogs, so a ‘manual’ search as described above is applied. If available, certain specialized equipment such as thermal cameras may also be utilized to assist during the search. Once the casualties are found, the message is passed on to the team leaders to prepare and plan the next steps. 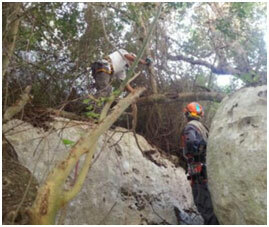 At least one rescuer always remains with the casualty and assesses the injuries to administer first aid as necessary. 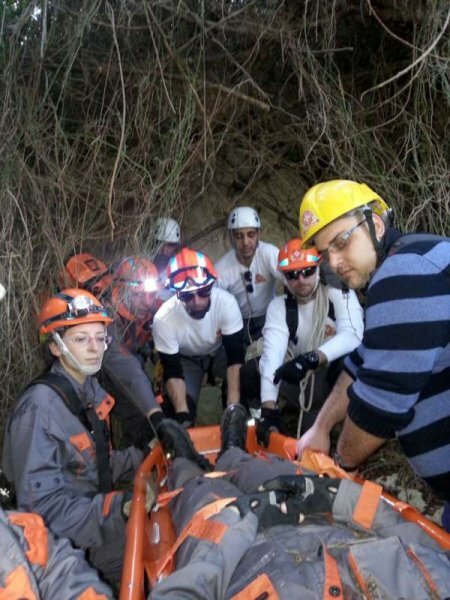 The information from the injury assessment is also passed on to the leader so that only the necessary equipment is carried down – both to avoid tiring the rescuers unnecessarily and also to minimize the possibility of losing expensive equipment. A small reconnaissance team is also sent to scout the area and identify the best (and safest) route back to street level. After being given first aid on site, the casualty is then prepared for the recovery step. 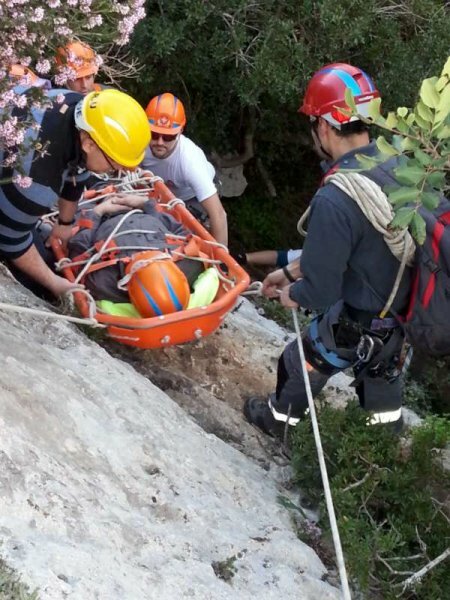 When a person sustains a significant fall, it is normal for the rescue team not to take any chances and immobilise the casualty using a cervical collar (neck brace) and a spinal board. This may be quite challenging at times due to the lack of space where the rescuers need to work, but these measures will prevent further injuries to the casualty. After immobilisation, the casualty is transferred onto an appropriate stretcher for this kind of terrain. 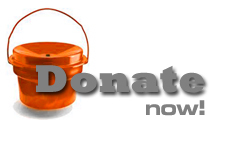 The bucket stretcher is a good candidate in the scenario we are describing. Care must be taken to secure the casualty well in the stretcher, as the route up to street level is likely to be steep and slippery. The stretcher is also prepared with ropes secured to it at its four corners. 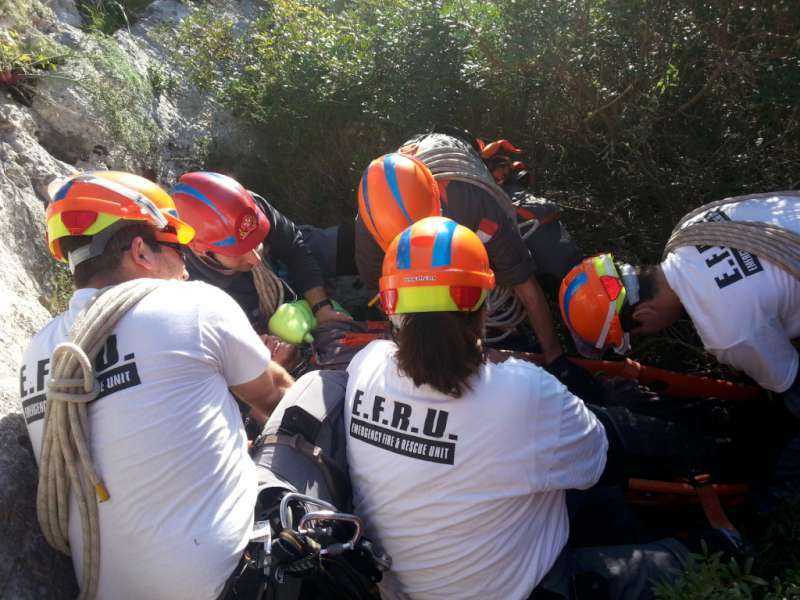 The two ropes at the front (near the casualty’s head) may be used to drag the stretcher where it is difficult for the rescuers to carry it, for example underneath tree branches. 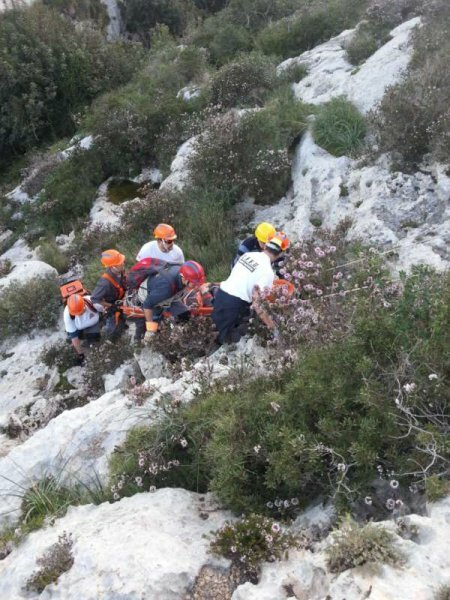 They may also be used to help the rescuers carrying the stretcher when going up steep terrain, if there are at least two extra people available. 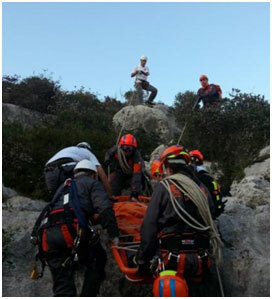 Sometimes, it may be easier and more efficient to suspend the stretcher towards higher ground when there is a very steep rock face or even an overhang: a group of rescuers on higher ground will pull the stretcher towards them by the two front ropes, while the rescuers below will keep enough tension on the back ropes to keep the stretcher suspended at an angle. This technique is known as the ‘Two Point Suspension’ method. Once back at street level, the casualty is handed over to the ambulance team together with all relevant information that will help the medics save time and administer the best treatment. 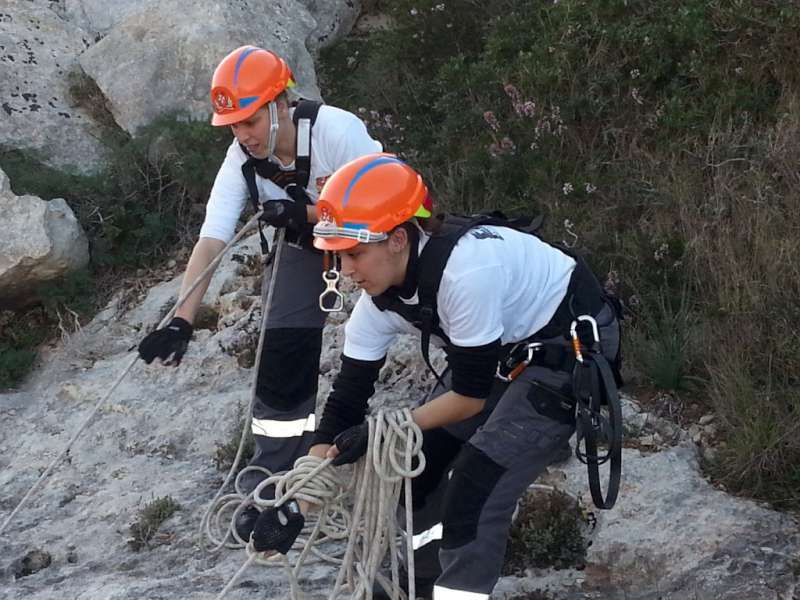 Needless to say, teamwork is very important in all phases of the rescue operation but even more so when using such techniques. This is an important element in any E.F.R.U. training exercise. 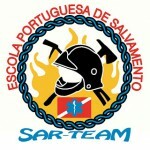 While the initial group was split in two in order to work in parallel to rescue two different casualties, the two teams were not in competition with each other. Team leaders regularly consult each other in order to direct their team members to help the other team where necessary. 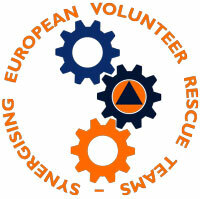 At the end of the day, there is one organisation (the E.F.R.U.) 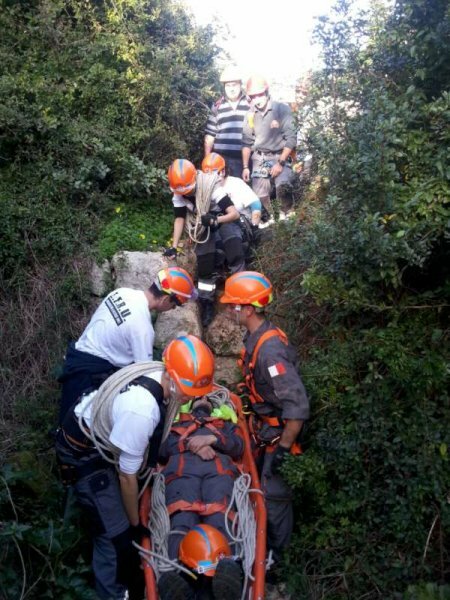 and one common goal – that of locating and rescuing the casualties quickly, efficiently and above all, safely.